ATLANTA, the United States, April 3 (Xinhua) -- The United States and China are capable of getting "a mutually acceptable deal" to solve the trade dispute that is eroding the enormous cooperation opportunities between the world's two largest economies, a U.S. state agriculture official has said. "I'm confident we will get a mutually acceptable deal. 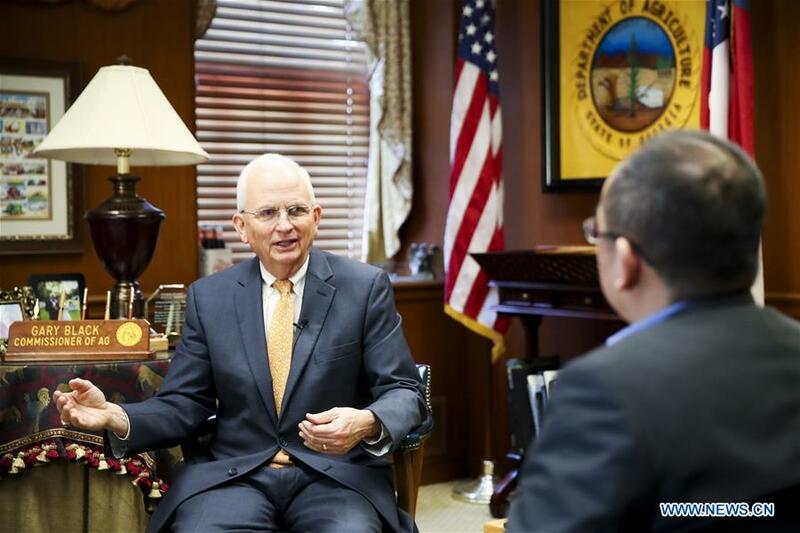 I'm hopeful some of our differences are going to be cured quickly," said Gary Black, agriculture commissioner of the southeastern U.S. state of Georgia in a recent interview with Xinhua at his office in the state capital of Atlanta. Calling the U.S.-China tariff battle "unfortunate," Black said trade ties with China are essential for the state's largest industry -- agriculture. "Georgia, in the Greek language, means 'a farmer.' So it is in our very being, it's in our name. Agriculture is roughly a 75-billion-dollar industry, the No. 1 segment of our economy," said Black, who heads the Georgia Department of Agriculture responsible for regulating and promoting the state's agriculture industry. "One in seven Georgians have a job that is somehow related to food and fiber, production or processing or marketing," he said. "The value of exports to Georgia economy, to our way of life, is in the billions of dollars." China was the third largest export market of Georgia in 2018 receiving 2.9 billion U.S. dollars of exports, according to the Georgia Department of Economic Development. Georgia farmers, pecan growers in particular, have already felt the pinch from the trade tension with China, Black said. According to the commissioner, the United States and China had successfully negotiated a reduction of the tariffs on pecan. But due to U.S. tariffs and China's retaliation measures, the tariffs crept up to even higher levels than the original ones. "It is no doubt unfortunate," he said. Black, who has been to China on two trade missions, said he believes a fast-growing Chinese middle-income market represents "enormous opportunities" for Georgia and the United States as a whole. "There's a great record of cooperation. I would say there's a great potential for the expansion of cooperation," he said. What is most important for enhancing the bilateral cooperation is that the United States and China build upon mutual trust and friendship at all levels. "We need to be diligent with each other and trustworthy with each other," he said. "I had every reason to believe, just as I do today, that it's good when people can meet people. And that builds a bond that allows you to do a lot of good things." "I think we should do more of that with our government, so that we have an understanding, that those who are making decisions have an understanding of each other," he said. "If we simply stay on the opposite sides of a table, my hope is that table in future years will not be so wide and probably we can make it easier to reach across the table," he said. "I believe the sun's going to shine. We may not see it tomorrow. But I believe there's a sunrise for us."